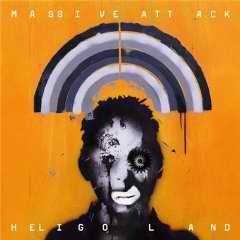 The band Massive Attack have been banned from advertising their new album Heligoland on the London Underground because it looked like graffiti. Robert 3D Del Naja who had to redesign his artwork for stations, said: They won't allow anything on the Tube that looks like street art. They want us to remove all drips and fuzz. It's the most absurd censorship I've ever seen. 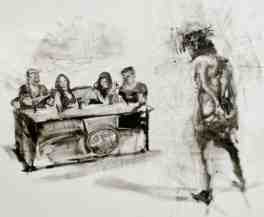 There is an exhibition at St Marylebone Church of the work of 20 artists' representations of the Stations of the Cross. Throughout Lent, some of these have been approved by TfL to appear on the London Underground. But not Antony Micallef's Kill Your Idol , a representation of the first station, where Jesus is condemned to death, this time by an X-Factor style panel of judges. A spokesperson for TfL said the poster was rejected because it did not comply with the firm's advertising policy. She pointed to a clause that concerns causing widespread or serious offence to members of the public and another referring to advertisements that do not comply with the law or incite someone to break the law. Important contemporary questions about the fickleness and shallowness of fame and celebrity, success and failure. About who has the power to say just who is going to be a 'hit' and who a 'miss'. It is not an image that could cause offence, it's not obscene; it is just a very, very strange decision. But of course the decision is nothing to do with nuances of offence. It's just that everybody knows that religion and satire simply do not mix, and anything coming anywhere close is simply best avoided for fear of either violence or else a station load of moaning minnies. It seems that religion these days is not really very welcome in the normal world, it causes far too much trouble in the world. A poster advertising a satirical play about the Monarchy and, showing Prince Charles gagged, has been censored by London Underground because it fears it could cause offence. 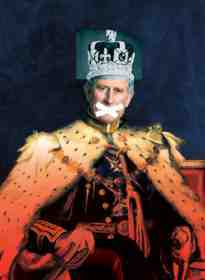 The advert for the critically acclaimed production of King Charles III features a punk-style portrait of the Prince with his mouth covered by white duct tape. But despite the fact that the poster has been displayed across London since the play opened nearly three weeks ago, a nervous Transport for London has decided to pixelate Charles's face. We work with a company called Exterion Media, which handles our adverts on the Tube network and offers advice. They may say this or that could cause offence. Exterion may have said the poster doesn't fit with part of their policy. The decision was made without reference to us and does look to have been a little over-enthusiastic. We will speak to them about it. Easily offended whingeing believers and/or aggressive bullying PC censors. Does any of this do anything to generate any actual 'respect' for religion? Adverts for a Jewish play which received five-star reviews in one of the religion's newspapers have been banned from the London Underground because they could cause offence . 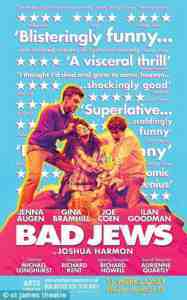 Transport for London (TfL) decided that posters of Joshua Harmon's acclaimed production, Bad Jews , should be banned. The poster for the comedy, which is about a family brought together after the death of their Holocaust-survivor grandfather, shows four characters in a quarrel on the floor. The advert, Bad Jews, was previously displayed on our network as our advertising contractor approved it without consulting us. It was subsequently submitted for display again and has been rejected as it contravened our advertising policy, which states that adverts will not be approved if they may cause widespread or serious offence. Half the cast are Jewish, I'm Jewish, the writer is Jewish and the word 'bad' in the title, in so far as it matters, doesn't mean 'evil' -- it means 'non-observant'. This is a form of censorship which is so weird and ironic when, in the wake of the Charlie Hebdo events, everyone marched against censorship. 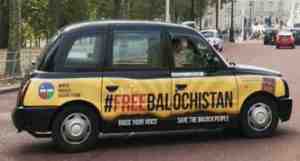 The World Baloch Organisation , which advocates for rights of the ethnic Balochs who live in the Balochistan regions straddling Pakistan, Afghanistan and Iran, launched its campaign on London's black cabs to highlight the war crimes and human rights abuses of the Islamabad government. The British High Commissioner in Islamabad was summoned to appear before the Pakistani Foreign Secretary, Tehmina Janjua, on Friday over the adverts which they said directly attack its territorial integrity and sovereignty. In early November the Transport for London (TfL) removed Free Balochistan adverts from London black cabs after pressure from the Pakistani government. Unsurprisingly TfL were quick to get the adverts off their property and to apologise for the offence, and this seems to have done the trick for them. The UK advert censors at ASA have also got caught up in international complaints resulting from the TfL campaign particularly as the adverts have now appeared more widely on advertising spaces that are not related to TfL. The High Commission of Pakistan and a member of the public had referred the advert to the ASA, arguing the slogan Free Balochistan was irresponsible and offensive to the Pakistani diaspora and an attack on the sovereignty and territorial integrity of Pakistan. In a letter to the World Baloch Organisation, which is running the campaign in London, ASA confirmed that it would not pursue the matter any further as there did not appear to be a breach of the code. The advertiser had a right to express their views, despite the issue of Baloch independence being a politically sensitive issue. The ASA's role was to assess what appeared within the ads, rather than making a broader judgment about the intent of the ad, or the political cause, being advertised. The ASA Council considered that the tagline '#FreeBalochistan' was an invitation to find out more about a particular political campaign itself, and the ad itself did not make any specific claim that threatened the territorial integrity or sovereignty of Pakistan... the ad was unlikely to cause serious or widespread offence to members of the public in general. Justice has prevailed. The ASA has affirmed that our campaign is within the U.K.'s rules and regulations. Moreover it has proved that Pakistan's narrative to malign our campaign is baseless and deceitful. Of course the Pakistan government is not so delighted: The Pakistan High Commission says it's reviewing the ASA's decision and article from thenews.com.pk reports a source sating that Pakistan High Commission will now launch legal action against the ASA. A spokesman for the Pakistan High Commission said that the ASA's response has been received which is being reviewed. The spokesman said that further course of action will be announced soon. It is an ongoing matter and we are in touch with the ASA.